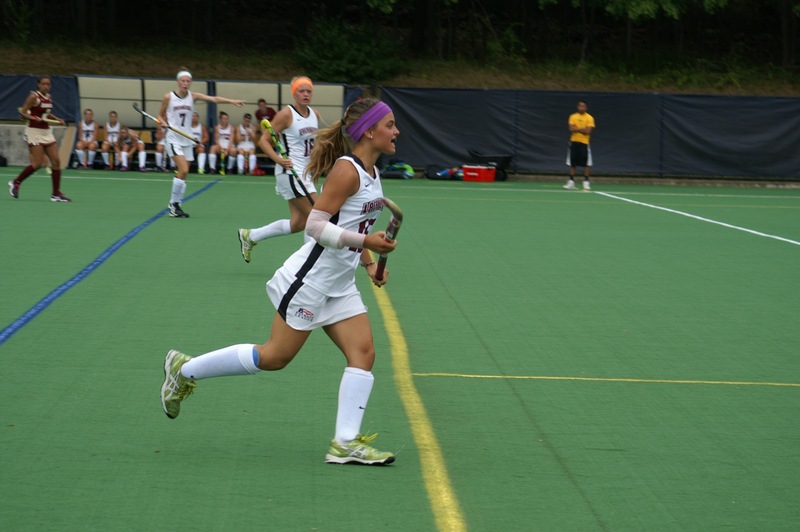 Fresh off her experiences with the Lafayette team in Spain, junior Amanda Magadan continued her intensive field hockey play by being invited to the Young Women’s National Championship, at the US training center at Spooky Nook in Lancaster,Pa. This is part of the selection process for the US teams for the coming year and beyond. Amanda has already played one year on the US under 21 team and she is hoping to continue on with the team and play in the Junior Pan Am games in the spring of 2016. All of the selectees were randomly assigned to one of eight teams. For the most part, these groups of strangers needed to figure out how to find success in game play over the course of the one week tournament. Amanda’s team USA Gold was assigned two coaches, Jarred Martin ( associate coach at Duke University) and Grant Fulton ( asst. coach at the University of North Carolina). Both coaches have extensive international experience and the team was led by the coaches who were, “hilarious, smart, and helpful,” according to Magadan. She continued,” Our team, USA Gold really grew over the week. We improved each game and really bonded.” The chemistry seems to have been there as they were undefeated in pool play during the week. The team learned to win going away and won the close games as they recorded goals of 4-1 in the first game, 1-0 in the second game and 2-1 in the third game. Amanda was active in the games as she recorded 1 goal and 1 assist. Many of the team’s goals were the result of their attack penalty corners. Their team managed to go to the championship but lost 2-4. Demonstrating her completive spirit Amanda added,” Although the week would have been a little sweeter ending with a win , our team had lots of fun on and off the field and I genuinely enjoyed my coaches and teammates. But the object of the tournament was to select players for the under 21 team and Amanda was again selected to Junior National Camp this tuesday June 30 through Friday July 3. It is there where the final selections will be made. Individually, Amanda has seen great strides in her play and hockey intelligence from being a part of the process, which she is grateful for. She will work hard and is aiming to get better. Ultimately all this work is preparing her for the season at Lafayette. She is looking forward to being with her fellow Leopards soon to begin final preparations for a successful fall in a maroon and white uniform. This fan can’t wait for preseason as the whole team returns in August. As Lafayette moved on to Valencia, they gathered additional momentum and inspiration from the World League games and put it all together in a 6-2 win in the fifth day on Spanish soil. Goals were spread amongst six players Meg Lillis,Rosie Shanks, Kirby Szalkowski,Kaitlyn Ewing and Katie Birle. Abby Stefanides, fresh from her flight from London where she is taking a summer course joined in the scoring with a goal of her own. It was the defense, who took inspiration from the offense as they found their rythm and held the Xaloc team to 4 shots, two of which were stopped by Katelyn Arnold. After the game both teams joined together in a friendly meal and exchange of gifts. As is the custom, the meal was a late one after which our “pards” boarded their transportation to return to the hotel for a well deserved rest. Tomorrow’s activity is more informal as the team will have chance to explore Valencia on their own before they become spectators again at the World Games. There will certainly be partisan interest as the games attended will include the USA vs Germany, Great Britain vs Canada, and China vs Argentina. Dinner is expected to be on their own as the now experienced travelers will choose from the great Spanish cuisine at their disposal before heading for bed. Maybe it will be more Tapas or some tasty fresh fresh fish from the Med. 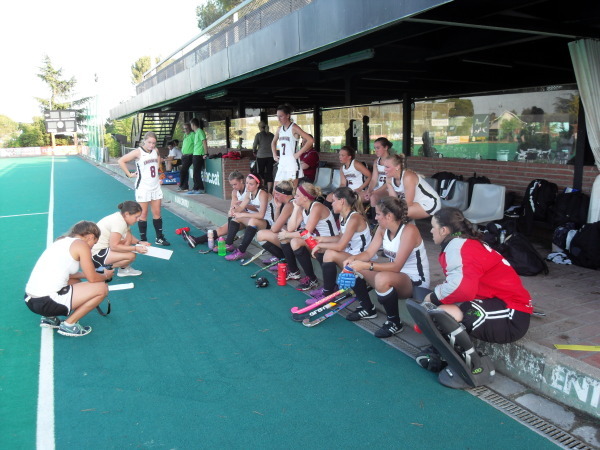 Monday will feature some more free time before their fourth and last game with a Valencia hockey club and a dinner afterward with their new friends. Coach Stone continues to be pleased the overall experience for her charges, as her team has responded to the challenge. 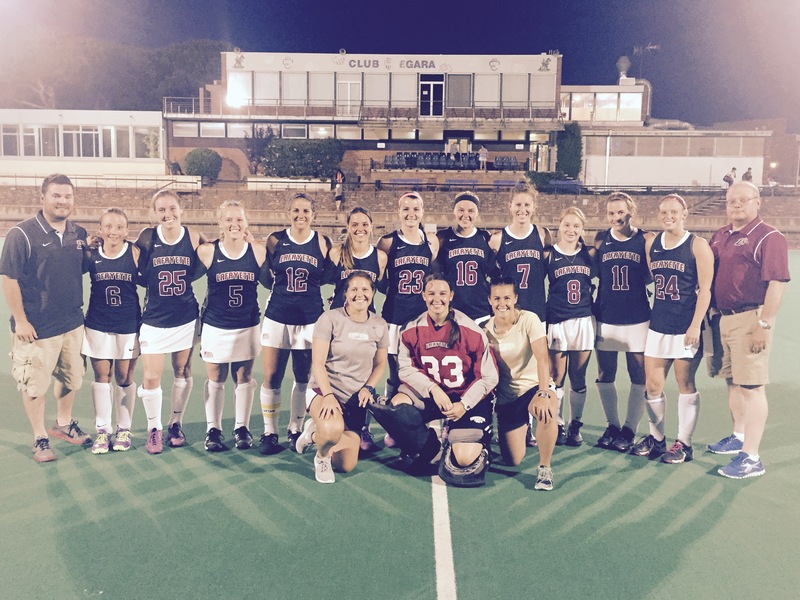 The Lafayette field hockey team encountered an unexpected challenge tonight as they arrived at the ATCH stadium in a suburb of Barcelona. Unfortunately the Leopard’s opponent, one of Spain’s top women’s club team, wasn’t able to field a team, but the club’s under 18 men’s team volunteered to fill in. Discounting the 0-5 score to Lafayette’s disadvantage, Coach Jennifer Stone was delighted at the opportunity. ” We took awhile to adjust, but the second half was very good and we were SO improved by the end of the game”, Stone said. Stone also singled out the work of goalie Katlyn Arnold who had 6 saves. In addition, there was special mention for her as the two teams practiced shoot outs at the end of the game. ” This was a great experience for the team and can only help our development,” Stone added. The team’s tour continues tomorrow as our “Pards” move on to Valencia where they will become spectators as well as players. They will be attending World League games where team USA will be matched up with South Africa. After that our Leopards will play a local club team in the third match of the tour. Finally they will end the day watching another World League match between Spain and Canada. 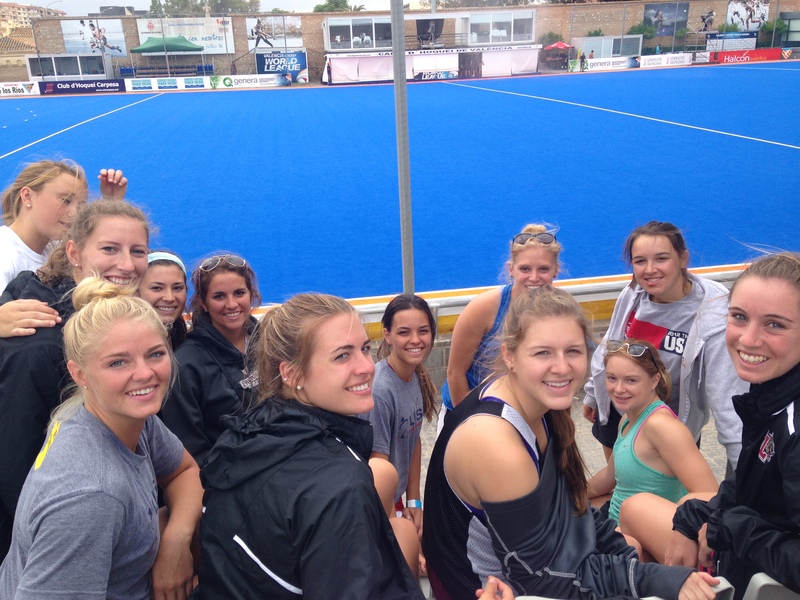 The weather has been spectacular and Spanish people and field hockey players have been extremely friendly, as our team absorbed all there is available of Spanish culture and sport. A special shout out to Dave Blasic the Lafayette administrator accompanying the team, who provided the featured picture at the top of the page. After an exciting and activity filled day on wednesday, our team gets some deserved rest and recreation, with what seems to be their favorite chill out destination …the beach. No doubt the rest was well earned, but our high energy cohort won’t let the grass grow beneath their feet. The sunny 80 degree weather joined with a bit of humidity adds to the draw. But it won’t be lying around after lunch, as they will receive paddle surf lessons, after which they will tackle the warm Mediterranean surf. After some sun and fun, they will again have a chance to sample more Spanish cuisine with an atypical 6 pm dinner. Perhaps they will be thinking about tomorrow’s time to explore more of Barcelona on their own, and their next game with the Valles hockey club. They will be reinforced tomorrow with two of their teammates, who will join them this weekend, while taking a break from their studies in Europe. I am sure they are emailing their friends and parents at home as well!!! I hope they are aware that the president of Lafayette College, Alison Byerly, sent her greetings to all after the game last night. As Lafayette’s first ex field hockey player president can attest, its hard to stay away from the game. Tapas and Teamwork.. Arnold shows acrobatic skill in goal!! Birle and Turner score goals in 2-0 win! The Leopards arrived in force in Barcelona after traveling on the 8th via a long flight from JFK to Madrid. Jet lag was put aside as they met their tour manager Christian, in Madrid.They then grabbed some lunch, and drove to Barcleona where they finally arrived at their hotel. At five o’clock our intrepid team grabbed transportation to dinner. Christian, their loyal tour guide who plays in the Danish men’s field hockey league, made sure the team got to the restaurant on time. He set up a private dinner at a local restaurant, where the owner opened on his off night, exclusively for our crew. Present also were Jim and Tina Gula ( parents of Kelsey Gula’13), and the Furneaux’s. Jim Gula was kind enough to relay all the details. The owner served a multi-course taste of tapas, and Jim reported it was very well presented and tasty. After the dinner the owner played american hit music and the girls, the Gulas, the Furneauxs, Coach Jennifer Stone , assistant Coach Emily Janis, trainer Jon Edward, as well as Lafayette athletic business manager Dave Blasic hit the dance floor until everyone decided it was time to get some sleep. Today they are scheduled for a two hour tour of the Sagrada Familia before changing this afternoon to start the hockey portion of the trip. At 6 pm they will have a light clinic with a Spanish coach before their 8pm match with ATHC after which there will be a tailgate with their opponents. Check back later at this site for the outcome and details of the match. Some additional news, today the Leopards also visited an institution that cares for special needs adults, and they played hockey with them to the delight of all. Posted on June 10, 2015 June 11, 2015 Categories SportsTags field hockey, Lafayette CollegeLeave a comment on Tapas and Teamwork.. Arnold shows acrobatic skill in goal!! Birle and Turner score goals in 2-0 win! The activity at the Lafayette field hockey stadium looked more like mid-August, rather than the normal peaceful June setting that might have greeted visitors this afternoon. The Leopard field hockey team was hard at work with a double session meant to sharpen skills and enhance teamwork before leaving for Spain next week. Having finished spring practice a month ago, their skill showed little sign of atrophy as Coach Stone and assistant Coach Civico put the team through a brisk series of drills meant to get the team’s timing sharpened and their fundamentals reinforced. Noting that there were at least seven new players arriving this fall, I asked what advice they had for the new Leopards. Magadan advised, ” They should be prepared to work hard, and not be afraid to ask questions.” To emphasize that point, Millen added, ” They will need to be willing to learn….we are one team and we will practice together and play together as one team. We will be there for them to help them adjust to the rigor of college and division one hockey.” The captains explained there is a structure in place where the first year team members are paired with second year team members to make everyone feel welcome. In addition, Millen explained the team is split into “family groups” and during the preseason they will have friendly competitions related to fitness and other contests. As my time with these two leaders ended, we finished with a discussion of what happens during the time between the end of the Spain trip and preseason. They both explained most of the team will be playing in summer leagues, and there will be captain’s practices every Sunday to get the team used to playing with each other. Both of these excellent student athletes showed their excitement and optimism for the coming season and a dedication to doing the best they can on the field. These are two excellent leaders who are finding their way to improving and making the Lafayette field hockey team into a cohesive unit. My next post will hopefully have news from Barcelona or Valencia with pictures from Spain!! For you parents going to Spain send me some pictures to include in the next blog! !